Schematic diagram of the fiber based radio frequency dissemination scheme for branching networks with the passive phase noise cancellation method. Three remote sites C, D, E are 2, 5 and 10 km away from the local site, respectively. Time is one of the earliest known fundamental physical quantities in nature. To maintain time synchronization between different places and establish unified time and frequency standards concern all aspects of the human production activities, and show broad application prospects in atomic clock comparison, astronomical observation, and deep space navigation. In recent years, due to its low loss and high stability, dissemination of time and frequency signals via optical-fiber links has developed considerably. On the other hand, almost all of the conventional schemes have a common "point-to-point" structure, namely there is only one receiving site connected to a single transmit site. Despite its high stability, the limited accessibility greatly limits further applications of the fiber based frequency dissemination technology. 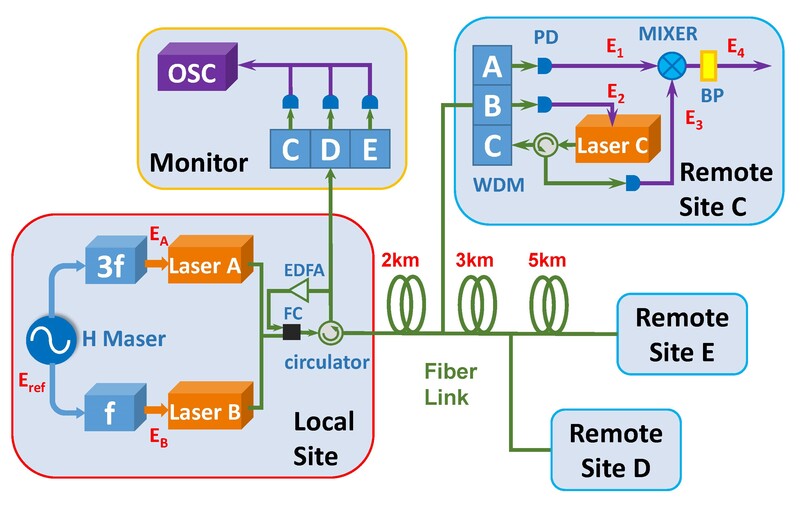 The researchers led by Prof. Lijun Wang, from the Joint institute for Measurement Science (JMI), Tsinghua University, proposed and demonstrated a new fiber-based RF dissemination scheme suitable for a branching network to overcome the main drawback of limited accessing area of conventional fiber-based frequency synchronization schemes. It is reported in Chinese Optics Letters, Vol. 13, No. 6, 2015. Using the passive phase noise cancelation method, the fiber induced phase fluctuation can be compensated without active feedback-locking loop, and the highly stable reference frequency signal can be delivered to remote sites simultaneously and independently. For 10 km distance dissemination, relative frequency stabilities of 6×10-15/s and 7×10-17/104s are obtained. The scheme can dramatically simplify the set-up and reduce cost. These advantages make it suitable for constructing the frequency synchronization networks for the Square Kilometer Array (SKA) and other large-scale scientific projects.. Associate professor Dr. Bo Wang from the research group thinks that the proposed scheme overcomes the cost and reliability limiting factors of conventional technology, realizes highly stable frequency synchronization for branching networks. Consequently, this new scheme has broad application prospects. A series of further experiments will be conducted including noise analysis and compensation methods to increase the dissemination stability. In order to verify that the scheme can be really applied in large-scale applications such as SKA, the system reliability and environmental adaptability will also be improved.